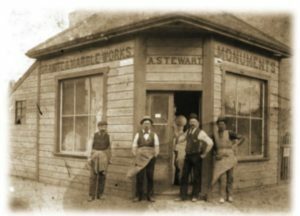 Over the last 30 years, Robert Poncelet and staff have continued the same tradition of honesty, reliability and exceptional quality that Alexander Stewart began so many years ago. Cemetery Headstones exist in some extremely harsh environments. Gravestones are in contact with the ground and are relatively unprotected from all kinds of weather conditions. This direct exposure to the natural elements determines Granite to be the only natural stone suitable for the environment. With a high density, and excellent polished finish, we guarantee our Granite to be of the highest quality in the industry, and back it up with a Lifetime Guarantee against breakage or natural flaws.